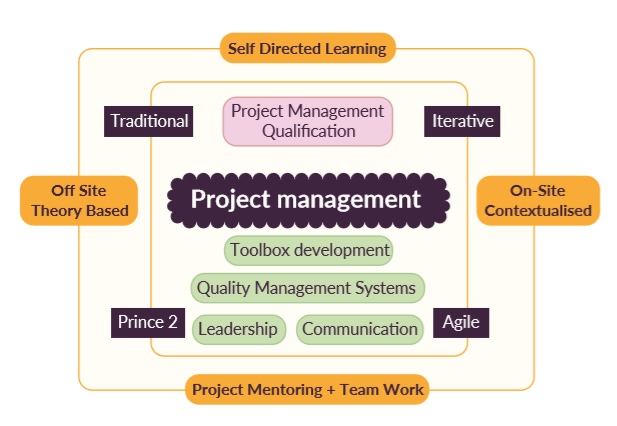 The associate project manager course is designed to impart project management theory and techniques, enabling participants to learn new, or enhance existing, project management skills. Through the application of a department and business based project that improves a service or product, you will become an accomplished project manager and leader. Utilising broad based theory pulled from Prince II and dsdm Agile concepts, developing a bespoke Project Management system for you and your area of work/expertise. Associate Project Management will run for 18 – 24 months – With centralised delivery of theory and local on-site remote web-based project management support. IPMA Level D Qualification Level 4 Apprenticeship in Associate Project Management attained through an End Point Assessment (EPA). English and Maths at level 2 if you don’t already have GCSE’s grade A*-C.
This Apprenticeship is based on theory and skills defined by ‘The Association for Project Management’ (APM) using their accredited (PMQ) qualification as the principal gateway. Subject to apprentice experience; the tutor can assist you to adopt a mix of project methods inclusive of Prince II and dsdm Agile. Enabling you to develop a rich understanding of the various project management methodologies, through practical application. You will enhance your project management toolbox for future project delivery. Being supported throughout a project lifecycle that is applicable to you, your role and your business. This apprenticeship is ideal for those in the following job roles: team leaders and mangers, staff working as part of a project team and associate project managers. Delivery is through supported, self-directed learning. You will have web-based remote support as well as a 1 day workshop each month. Assessments will be submitted online. For more information about the Level 4 Associate Project Manager course please contact us.